According to The Wonder Weeks app the next leap is in one week but apparently I didn’t have that time as the fifth leap already began. The Little one is crying harder and fusses over nothing so this time it’s a quickie. Protein smoothie again! As nothing is better than those when I am busy. Put all the ingredients in the mixer and mix well until orange skin becomes finely chopped. If you don’t like the taste of skin pieces you can strain the smoothie once to get rid of skin excesses. I liked it with skin as it tastes so orange and so citrus fresh! Sprinkle top with ginger powder and put some frozen berries, and here you have delicious summer drink! Smoothies are love, especially in summer. And as I finally finished those indulgent zucchini brownies and was feeling kind of full, so I turned my head towards mixer. As it is smoothie time! I looked up in my　fridge and found mango and ripped banana. Unfortunately I happened not to have yoghurt, although I usually have some extra yoghurts in stock, so my idea to make lassi kind of smoothie died there. Ok, moving on. Almond milk then. But I can use some spices to make smoothie taste kind of Indian. Our family loves spices so much that we have almost any kind of what can be purchased in supermarket. Cardamon is Indian enough. Let’s go with cardamon. And protein. Protein smoothies are my favorites. Of course, if you don’t have or don’t feel like putting protein into your smoothie it is fine. Mine is cocoa flavor so you may just put one tsp of cocoa powder instead. I recently bought chia seeds and now I am experimenting with those little gems, adding them to overnight oats and so on. So why not add them to my smoothie? Put all the ingredients in mixer and blend them. Mind that chia seeds are best when after being soaked for sometime, so I made smoothie and just put it into fridge for half an hour. Cardamon flavor and mango, oh that is so good on hot summer day! A real treat! Protein Berry Smoothie it is! プロテイン ベリー スムージー しかない! Hey beautiful people, isn’t it hot these days? I guess rainy season is almost over in Tokyo and we are to face usual oven heat for another couple of months. Sometimes the kid is taking too much attention (never too much for him! ), so taking food for me became a real challenge. But hey, skipping meals is never an option as it won’t help me to say bye bye to baby weight. So here I thought, what can I make quickly, like a snack, that is nutritious and healthy at the same time. And cold. 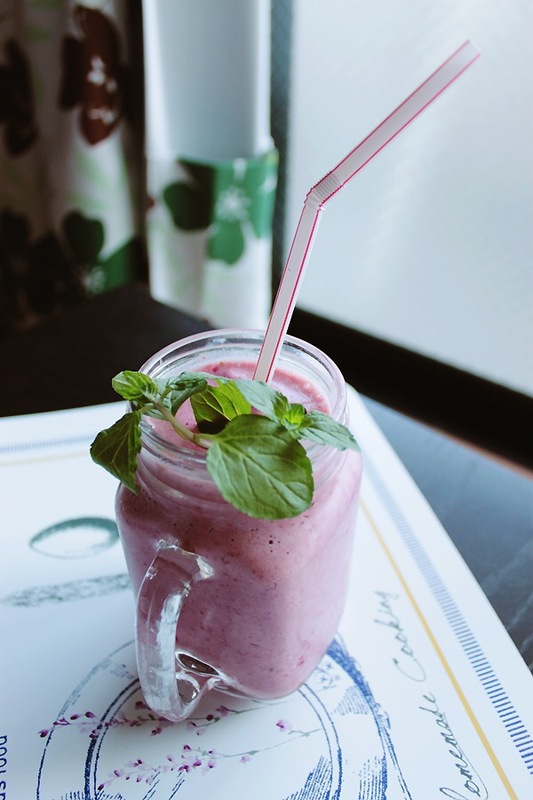 Smoothies are great for all the seasons, and when I was working out before pregnancy, that was one of my favorite fueling snack before/after workout.But now, as I still can’t workout in gym or have full mean workout at home, I don’t burn that much calories, which means smoothie recipe has to be revised. First, no bananas. Oh gosh you have no idea how banana addicted I am, but calories first! Frozen berries like raspberries, strawberries and blackberries are wonderful option to go low but nutritionally high. Second, protein. As I want my smoothie to be loaded not only with carbs. Protein powder is easy to add and flavored ones like cocoa or vanilla ones add to the taste nicely. Last but not least, to keep it healthy, I like switching cow milk for almond milk here and there, plus it gives nice smooth structure to the smoothie. Win win! Mix all the ingredients in food processor – simple as it is! To avoid protein powder from flying around the kitchen, add it directly to milk and stir a bit. Pour into one big jar to enjoy alone or into two glasses to share some healthy wibes with your loved ones! 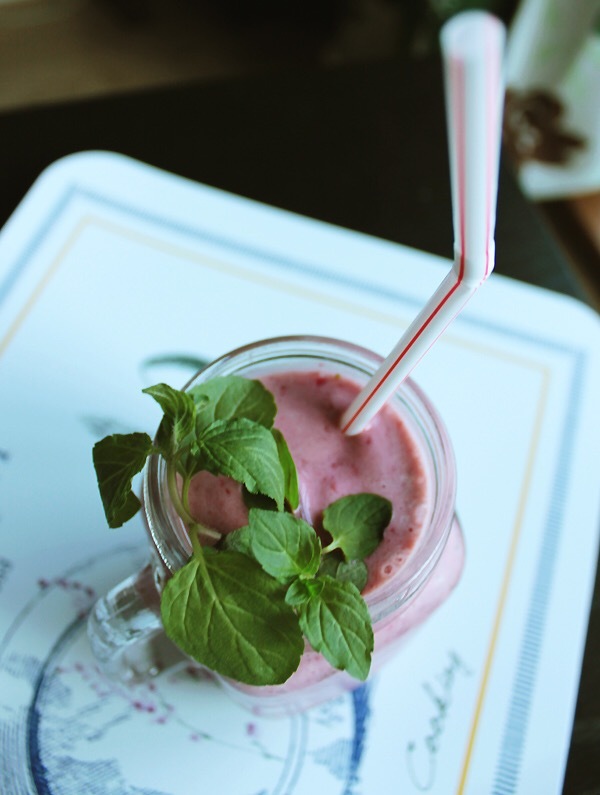 Don’t forget to decorate smoothie with mint, as it adds to fresh flavor! The smoothie came out thick and almost like ice cream or frozen yoghurt, a real treat I must say! Could not wish for more! Try it out, you won’t regret I promise!